Parasailing and Paragliding in Barbados! Imagine harnessing into a parachute and skiing off into the sky high above the boat and beach or jumping off a cliff to soar in the wind, admiring the gorgeous view below... during your Barbados vacation these dreams can come true! Soar to 250 feet above the beautiful Caribbean sea admiring the coastline of Barbados. You can enjoy their experience on your own or in tandem with a loved one or friend. It truly is an amazing experience! Just get settled in the harness and, after some tips from your friendly guide, up, up and away you go! 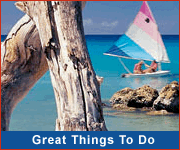 For information on paragliding in Barbados, contact the Barbados Paragliding Association. 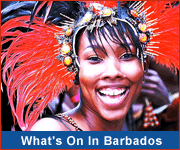 The association is an affiliate of the Barbados National Sports Council.